So…it’s National Pizza Pie Day. Yep. I don’t mess around when it comes to holidays…and after a busy day on the go (with an amazing brunch, coffee, shopping, and a stop off for some crazy-good ice cream)…I came home for a bit to relax. And I knew…that despite the brunch and ice cream treat, my roommate and I were going to need something else for dinner. And with it being National Pizza Pie Day…I had just the thing in mind. Please note…I realize this is not actually a pizza “pie” per se…but it is…technically…a form of pizza. Even better…it’s a form of pizza I can eat. Now, I’ve done my share of sampling of gluten-free frozen pizzas since going gluten-free. Kind of. Normally, despite craving some gluten-free pizza at times, I don’t like paying an arm and a leg for a frozen gluten-free pizza. I’d rather go spend that money and get one done up right at a restaurant (like Mellow Mushroom or Uncle Madio’s where they take extra precautions with gluten-free pizza preparations). It would end up being about the same amount for the same amount of pizza actually. And if not, the quality is far better. But, last weekend, my roommate told me she would buy me a gluten-free treat of my choice while we were roaming around Earth Fare, my favorite grocery store…ever. It took me a moment to ponder out what exactly I wanted to get with such a tempting offer. And after struggling with choosing between a sweet treat, gluten-free onion rings, gluten-free vegetable pot stickers…I finally decided to go with Ian’s Allergen-Friendly (no wheat, no gluten, no dairy, no casein, no soy, no eggs, no peanuts, no tree nuts) French Bread Pizza. This is not a new product. Not at all. In fact, I’ve seen this product in the freezer section of my local grocery store since I had to go gluten-free…and always said I was going to try it. Unfortunately…the price just never was right and I couldn’t justify it in the end with my tight food budget. But…as a treat…it might be worth it. Especially if I needed a quick hit of pizza sometime. Well, what better day to eat it than National Pizza Pie Day? The box comes complete with two slices of gluten-free French bread that is topped off with a tomato sauce and Galaxy’s vegan mozzarella rice cheese. I wasn’t sure what to make of the product upon opening it. The frozen bread looked like any normal frozen pizza would have done. 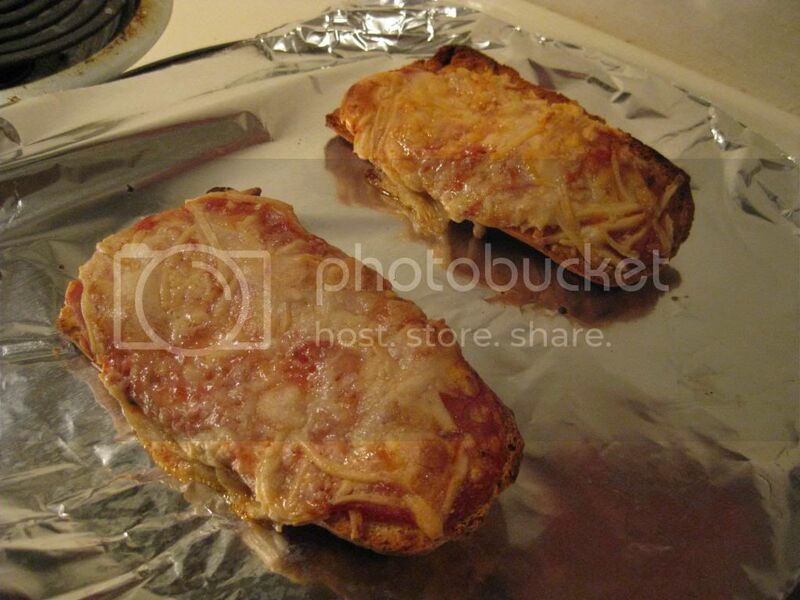 I wasn’t sure how well the “cheese” would do in the oven, but I preheated it to the 400°F the box suggested and placed each slice of bread onto a baking sheet. Into the oven it went for 23 minutes…but since my oven is a bit off…I let it go for 25 minutes before removing it. Much to my surprise, the “cheese” melted beautifully over the slices of French bread. The tomato sauce was bubbly and the cheese was piping hot and gooey. In fact, some of it had even stuck to the pan. So, that was a nice surprise. Vegan cheese never melts this well lately (and trust me…I eat it all the time). The French bread crisped up to a beautiful golden color. That was a nice surprise! So, I plated each slice, handed my roommate hers and went to retrieve mine. She was already digging in when I returned so I inquired as to what she thought. I mean, after all, she can eat any pizza whenever she wants. It’s me with the dietary restrictions. “It’s yummy!” she said. So…I went ahead and took my first bite. Despite the fact that I burned the roof of my mouth on the molten vegan cheese…I had to agree with her. This was a delicious bite of pizza. And so easy. I mean…for something frozen and out of a package…the flavor was amazing. I loved the crispy crunch the crust of the French bread gave each bite. And the the inner parts were soft and chewy, like a good pizza crust would be…without being doughy or overly chewy. The sauce was a non-entity and the “cheese” just gave it that pizza topping that was necessary for it to be a pizza. But…it was good. It was really good. Each slice of bread contains 250 calories and 10 grams of fat. The sodium content is quite low, at only 220 mg per serving. And each slice offers up no cholesterol, no trans fat, and 3 grams of protein. Nice! And despite being rather small in size, these slices of French bread pizza are definitely filling. I didn’t even need a salad or anything to eat with it. Perfect as a meal on its own and rather safe for basically any food allergy. It was only recently that Ian’s moved away from soy cheese, which was a fantastic choice in the end, opening this one up for people who have soy allergies. All the products Ian’s puts out contain no artificial flavors, colors or preservatives…ever! I would definitely buy these again in a heartbeat. The crust was awesome…loving the crispy outside and soft inside. It wasn’t overwhelming with the amount of bread. The sauce and cheese were a great topping. And these were so easy to prepare and so delicious to devour. Which is exactly what happened…while watching Moonraker on Blu-Ray. 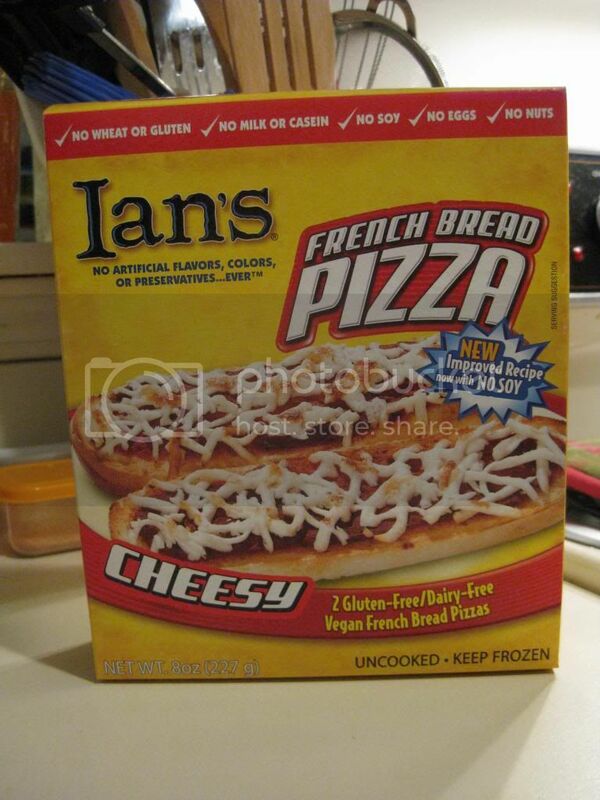 There is no better way to spend Naitonal Pizza Pie Day than enjoying a gluten-free and vegan French Bread Pizza…from Ian’s. Find it in your grocer’s freezer section…and give it a try yourself. This entry was posted in Bread, Cheese, Entree, Food, Frozen, Gluten-Free, Pizza, Products, Review, Sauce, Vegan, Vegetarian by The Celiathlete. Bookmark the permalink.